The confirmation today of two more launch dates signals that the 2018 season is already underway. However, preparations for 2021 are also in progress as Liberty Media, the FIA, the teams and race promoters hold various meetings, including today's Strategy Group get together, and discuss plans for the next decade. Though Liberty's financial plans for the sport's future have yet to be announced, its proposals for the new engine formula haven't gone down well. While Honda opts to maintain a dignified - or it that embarrassed - silence, Mercedes and Renault have admitted their unease while Ferrari, in typically Latin style, is already talking of a breakaway. 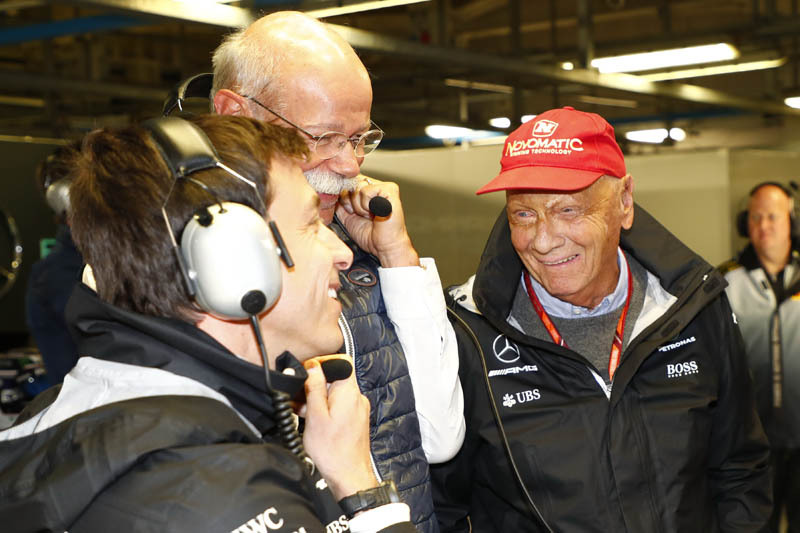 Daimler chairman, Dieter Zetsche, the man who signs the cheques for Mercedes F1 programme admits that while not following Ferrari's example of throwing his toys out of the pram, admits that he fully understand and supports the Italian manufacturer's stance. "We are the good cop and the bad cop," he tells Autocar, though omitting to see which cop he identifies Mercedes as being. "We beat each other like crazy on the track and try to get every tenth of a second of advantage but at the same time we are 100% aligned on our thoughts in Formula One and our strategic actions in Formula One. We are good friends." Echoing Ferrari's fear for the future of the sport as the powers that be seek to standardise more components and essentially compromise its DNA, be it in terms of spending or the technical regulations, Zetsche adds: "We are there to stay in Formula 1 but of course the platform itself has to stay meaningful and develop positively. "We want to be successful and we want the platform to be successful and when one is dominant that doesn't help," he admits. "We need stronger competitors and rule changes which give new cars to everybody and to some extent, this last season was that change." Formula One Management Fs up! F1 looking for style over substance? "I will settle for MotoGp... and Moto 2.... and Moto3. That is enough excitement and overtaking (probably around 200 for the 3 classes) for my Sunday. And they have the pit girls and not a halo to be seen. SMILE"
"How long before Daimler drops F1 in favour of FE.....not long methinks...then where does Liberty go ? They dont care as they are stakeholders in FE....Thank Heaven there is BTCC and MOTOGP cos thats where most will be going..."